SHPE-TC's 6th annual Noche De Ciencias at Hiawatha Collegiate High School. This video summarizes our fourth annual Noche de Ciencias, an outreach event where we promote science, technology, engineering and math to both parents and their children in the hopes that they want to become STEM professionals. This event took place at Cristo Rey Jesuit High School in South Minneapolis. The video for our outreach activity this past October 28th 2014 is now here. Noche de Ciencias is our third annual outreach event where we promote science, technology, engineering and math to both parents and their children in the hopes that they want to become STEM professionals. This event took place at Cristo Rey Jesuit High School in South Minneapolis. 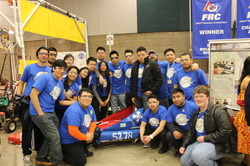 SHPE-TC has been supporting the Cristo Rey SHPE Jr. chapter in its first participation in the FIRST Robotics contest. They report that the robot is completed and is sent out for competition March 6-8 in Duluth. As this was their first year, there was a lot of learning by mentors and students alike. They made a functioning moving robot controlled by a laptop which is a good achievement for a rookie team. Some additional design was made for manipulators on the robot but the design was finalized late in the game and they ran out of time to complete the extra designs that were set up with the time they had. They are currently trying to do a follow-up meeting with mentors and students when they get back from Duluth, MN to complete the rest of the manipulator design that was intended and it might be a good opportunity to video this 'hands-on' activity. The team name is "Los Clásicos" (pictures not yet available, but artwork is). For more information, visit: http://www.mnfirst.org/frc/duluth-regionals. SHPE-TC hosted our 1st annual Noche de Ciencias on October 24 in 2012 at Cristo Rey Jesuit High School (http://www.cristoreytc.org/). Students and parents participated in a night of science fun and education about the benefits of pursuing a STEM career. SHPE Foundation works with SHPE student and professional chapters across the United States to coordinate a STEM outreach national campaign -- SHPE Noche de Ciencias. Noche de Ciencias was first hosted in 2008 and is a series of awareness events presented to K – 12 students to promote knowledge and interest about science and engineering as well as scholarship and college opportunities. Grade appropriate hands-on activities are hosted during the event. In addition, Spanish and English workshops for parents on college choice and financial aid are hosted.